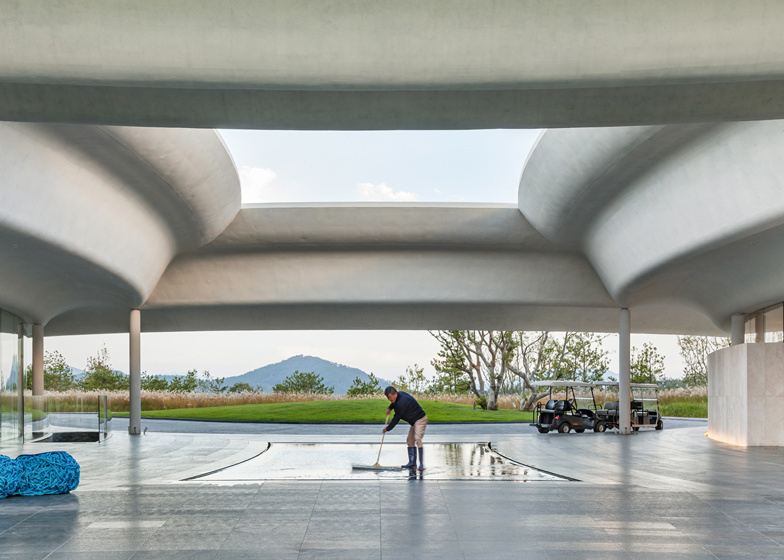 Sweeping lengths of concrete create curving canopies around the perimeter of this golf clubhouse on South Korea's Changseon Island by Seoul architecture firm Mass Studies (+ slideshow). 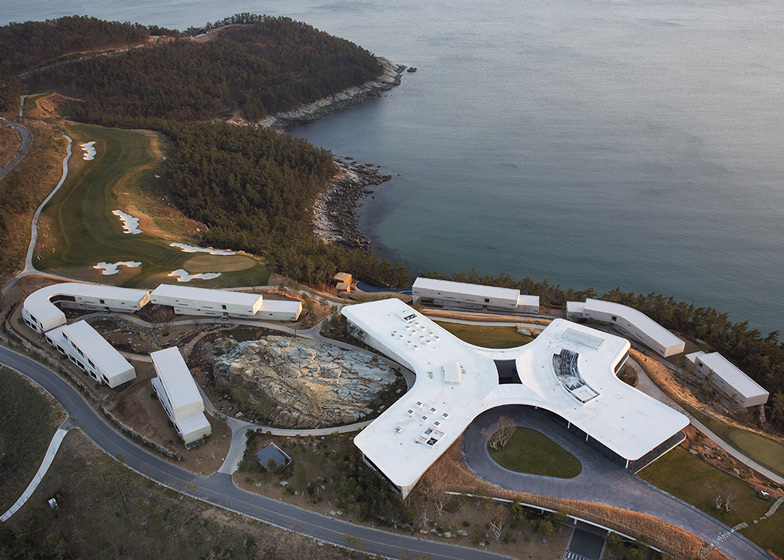 The clubhouse was designed by Mass Studies to provide dining and spa facilities for the South Cape Owner's Club golf resort and it is located at the peak of a hill, where it benefits from panoramic views of the sea. 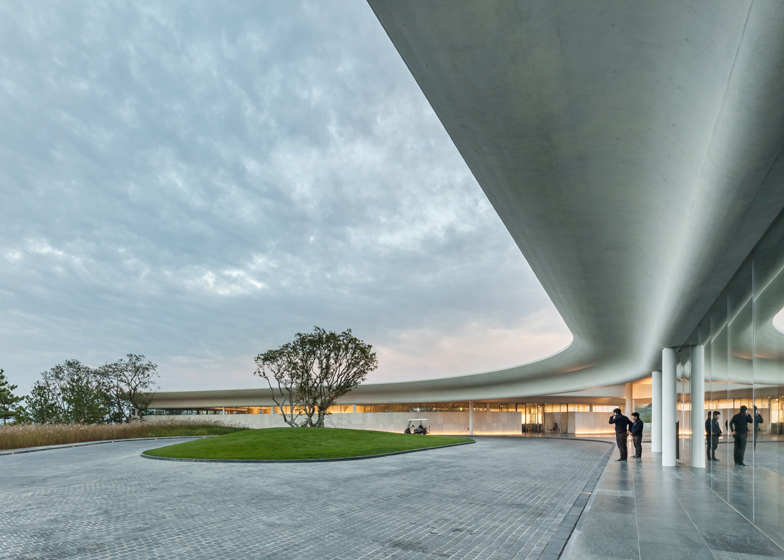 Described by the architects as being like "a pair of bars bending outward", the building's plan comprises a pair of curving single-storey blocks that are both sheltered beneath one X-shaped roof. 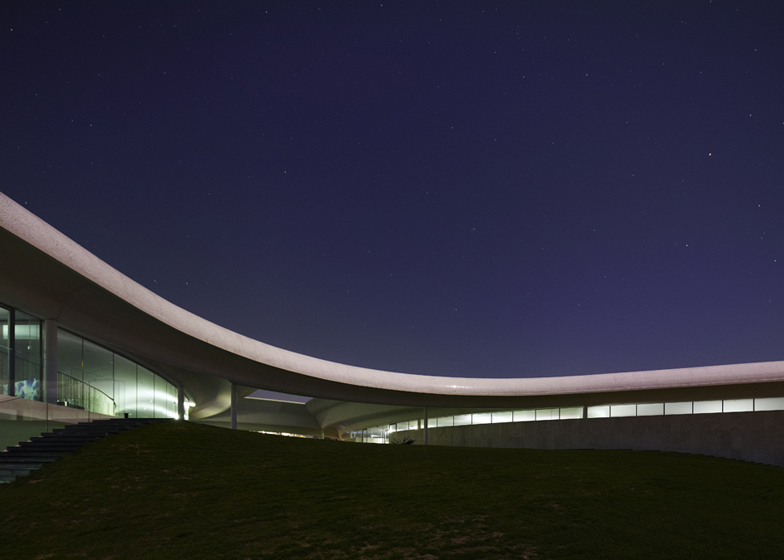 "The two curvatures of the building engage with specific moments of its immediate surroundings, hugging the existing context - the rocky hill to the east, and the vista out toward the cape to the west," said the designers. 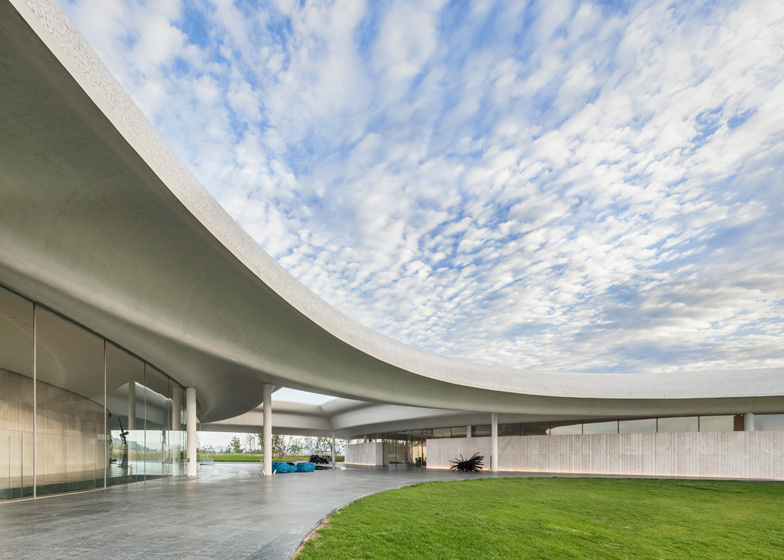 The curving canopies follow the bowed walls of the two blocks, but also integrate a series of smooth folds that present dramatic changes between light and shadow. 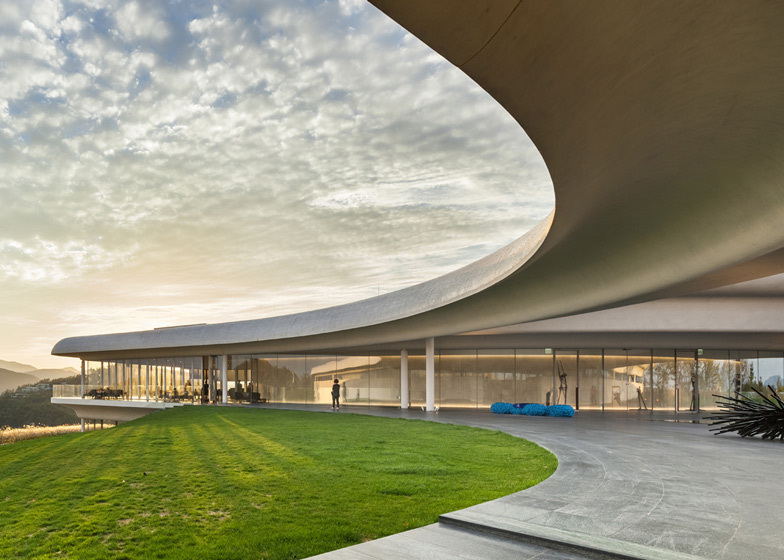 "From a distance, the appearance of the clubhouse reads horizontal, demure, and subtle," explained the architects. "However, once in and around the clubhouse, one begins to have a dramatic experience through the perspectival exaggerations and the views framed by the illustrious canopy edges." The western arm of the building accommodates the dining areas. A banqueting hall and restaurant are positioned at opposite ends of the block, and both feature fully glazed facades that open out to terraces around the perimeter. 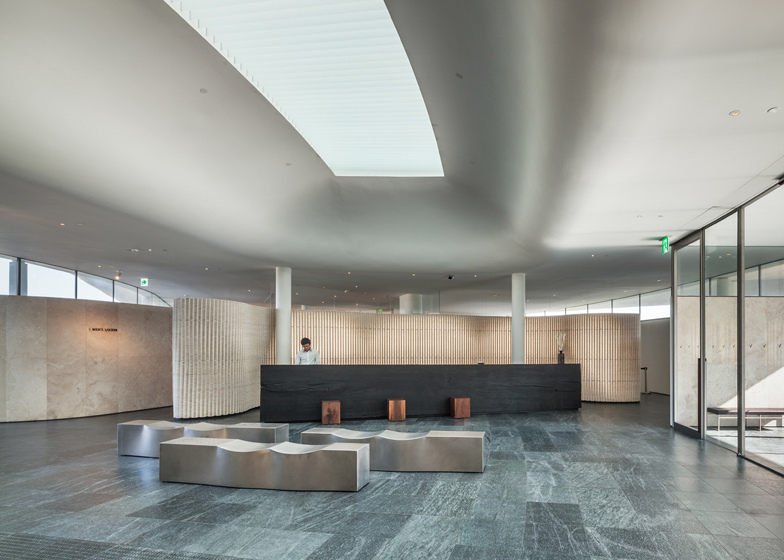 In contrast with this transparent structure, the eastern wing of the clubhouse has an opaque concrete facade that maintains the privacy of club members using spa facilities, but brings light in through clerestory windows. 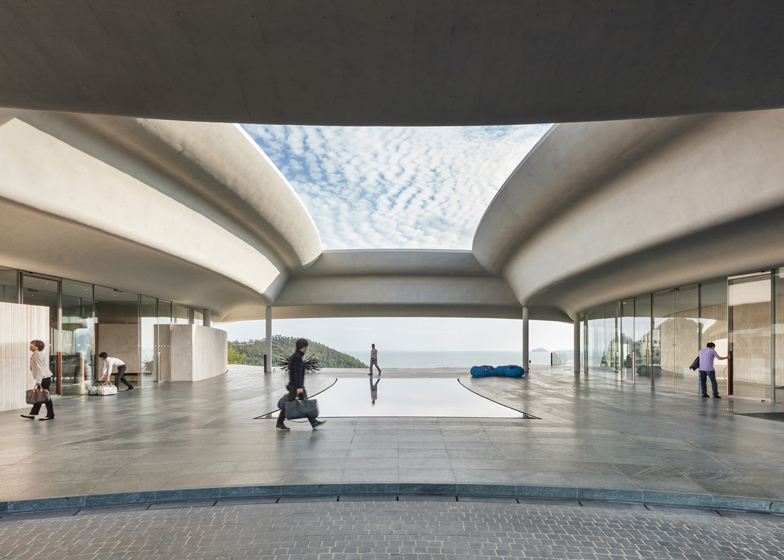 Areas for men and women are divided between the two halves of the block, but both lead out to private outdoor pools offering views of either the coastline or the distant landscape. A patio is also sheltered beneath the roof to create an entrance for the clubhouse. There's a skylight in the centre to allow daylight to filter into the space, while a pool of water is positioned directly underneath. 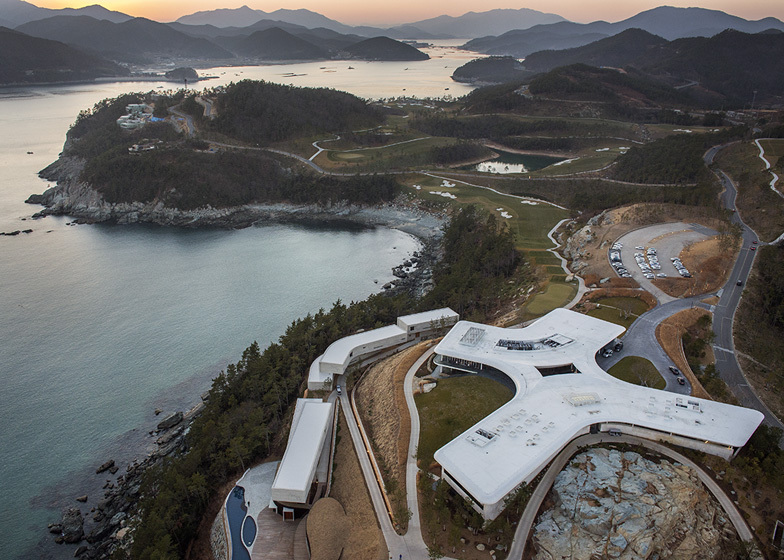 Located on Changseon Island in Namhae Province, at the southern tip of the Korean peninsula, is a resort development - the Southcape Owner's Club - with several complexes that are strategically positioned throughout the dramatic topography of the archipelagic region. 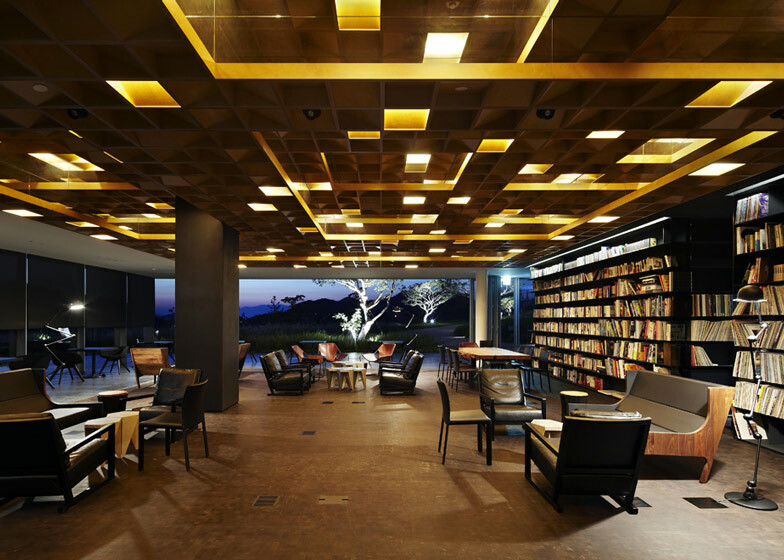 The apex of the resort is the Clubhouse, which in plan is essentially a pair of bars bending outward. 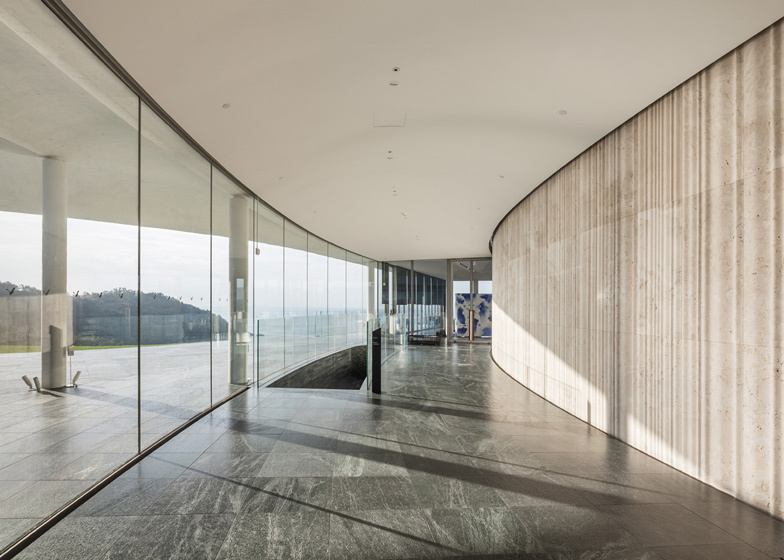 The two curvatures of the building engage with specific moments of its immediate surroundings, hugging the existing context - the rocky hill to the east, and the vista out toward the cape to the west. 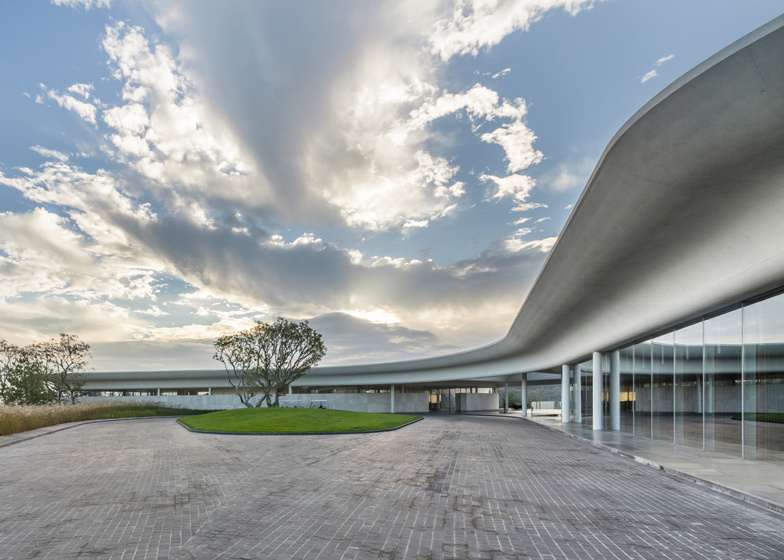 Simultaneously, the composition of the curved masses allow the building to also embrace what is to the north and south - a grand entry round-about, and a remarkable ocean view to the south, respectively. 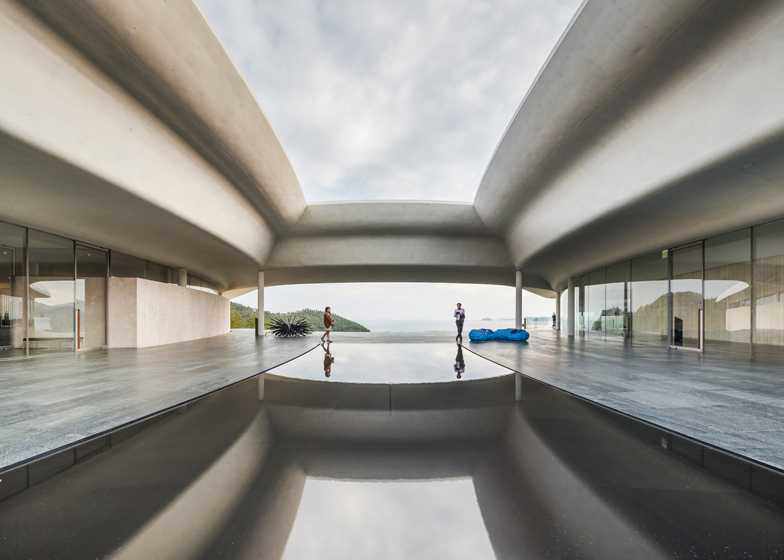 An open central zone is formed, anchoring the entire complex in a culmination of an impressive entrance patio under a sculptural open-roof, a reflection pool directly below, and a spectacular framed view of the South Sea. To the east are the more private spa facilities, and to the west, the more public restaurant, private dining, and event facilities. There is a contrast that takes place, not only programmatically, but also in materiality – solid vs. transparent. 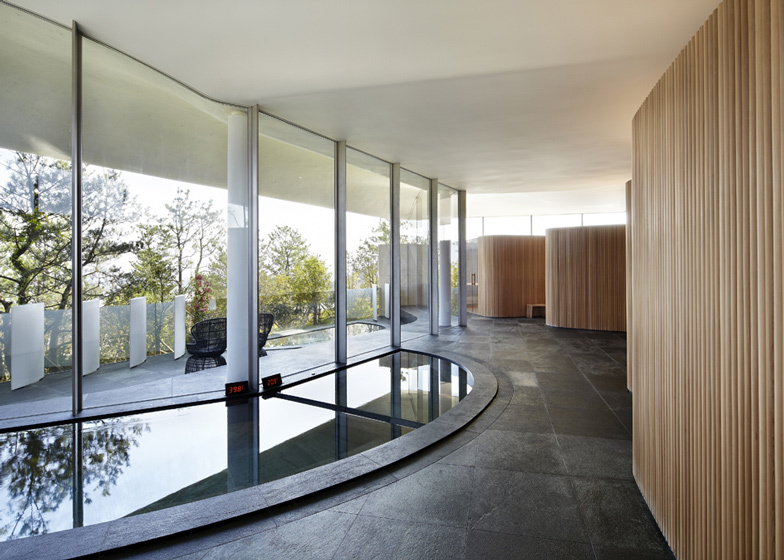 The spa area is mostly designed as a closed mass, with a slightly open 1m clerestory running along the entire length of the solid exterior walls and roof, progressing to a fully open release at both ends of the volume, which allows for an outdoor terraced bath for both the men's and women's spas with views out to the South Sea and waters beyond the landscape to the north. The dining areas are all glass-clad with extended perimeter terraces to all sides, offering a sense of openness out to the waters and landscape. 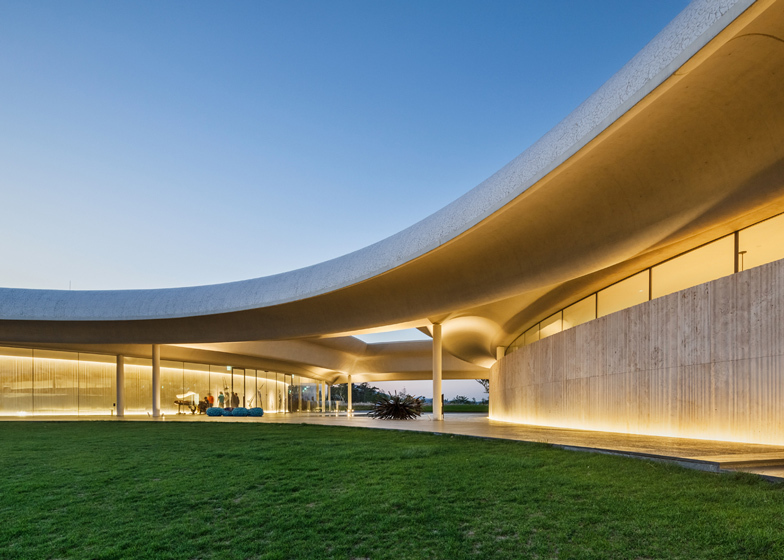 The sculpted roof of the Clubhouse is derived through a geometric rigour driven by the systematic structural organisation, which is a response to the three-dimensionality of the natural context. 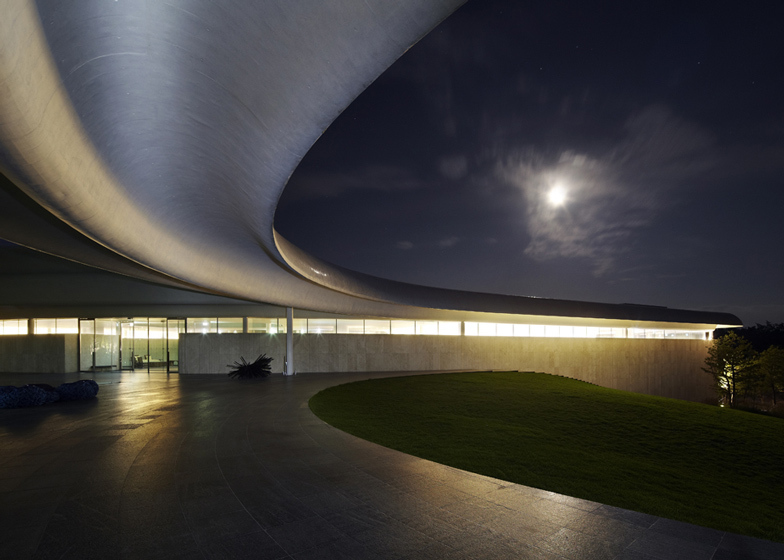 The depth of the curved steel beams are revealed, as if it were a vacuum-formed white concrete membrane, where a series of vaulted concrete canopies ultimately form an x-shaped, exploded circle in plan. The 3m canopies that outline the entire roof not only function as a shading device, but follow the overall architectural language, as the edge conditions change in direction, up and down, from the north to the south side of the building. 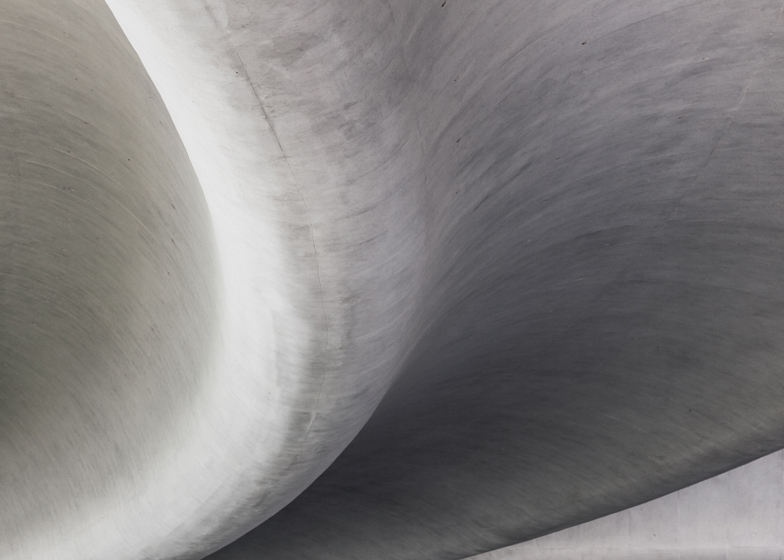 It adds to the sensuous movements that are portrayed throughout the building. From a distance, whether from the deck of a boat afloat the South Sea, or from a distance in the rolling landscape of the island, the appearance of the Clubhouse read horizontal, demure, and subtle. However, once in and around the Clubhouse, one begins to have a dramatic experience through the perspectival exaggerations and the views framed by the illustrious canopy edges. 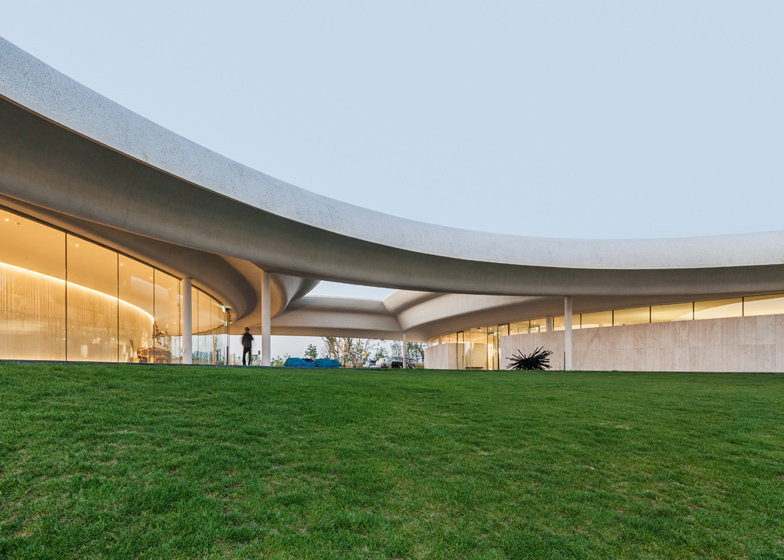 The Southcape Owner's Club Clubhouse is a seamless, continuous, and complete object in nature, with a shape in plan that creates a complex relationship with the surroundings, in rhyme with the ria coastline of the archipelagos that are unique to this region. Civil/Geotechnical Engineer: Korean Geo-Consultants Co. Ltd.